The Moinho da Fonte Santa works as retreat for artistic creation dedicated to artists, performers, writers, investigators, musicians, etc… Through a residency program with the variable duration of a few days to three months, the space instigate the ideal of sharing and the contact with nature in a geographical area isolated on the margins of the bank of Lucefecit, in the municipality of Alandroal. After 15 months of existence of the project, we talked with Mafalda Santos and Manuel Mesquita, the creators of the concept of this artistic residency, about the work they have been developing. What is the purpose of the creation of the Moinho da Fonte Santa? 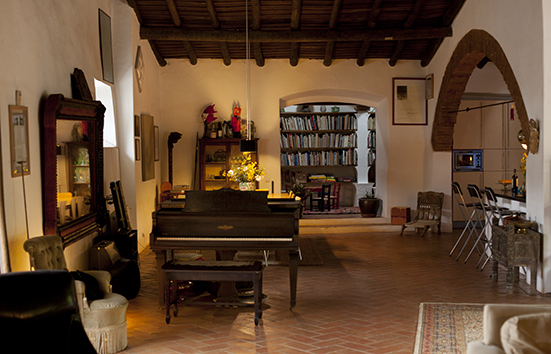 The Moinho da Fonte Santa was created with the purpose of maintaining and developing the creative dynamic and social contact that always existed in this house as residence of the painter Michael Biberstein and the writer Ana Nobre Gusmão, over more than 10 years. The Moinho was a meeting point of many friends, artists, musicians, so when the painter Biberstein passed away we felt that it was the right time in our lives to lead a project like this that could keep the Moinho da Fonte Santa working. How many artists have participated on these residencies? Since January 2014 we had a few collective and individual projects with us here. Not only plastic artists, but also visual arts artists and quite a few musicians, film producers that most of the time come to work on their argument writing, and even people that came to develop their PhD. thesis, etc. But to give you a close number…: individually maybe 15 people and collective about 5. We also had a workshop which went really well, oriented by the artist Claire de Santa Coloma on which she reused materials from the surroundings: she gathered different kinds of wood and the workshop was about carving wood. Now there are residencies taking place that were programed by us with people invited by us that came here to develop their work with the support of Gulbenkian that we obtained in the end of 2014. There are three residencies here that are benefiting from that verb. One with the “Circulo das Leitoras Peripatéticas” of Susana Gaudêncio, Sofia Gonçalves and Susana Pomba, that worked from the material of the Library Biberstein-Gusmão to write a guide which purpose is to be read during a walk around the Moinho da Fonte Santa. We will have a public presentation of this initiative by the end of May. Recently we had the Oficina Arara (from Porto) which works mainly with silkscreen and organizes a series of street projects and independent publications. We will have another group of artists that has been participating in several exhibitions commissioned by João Fonte Santa [the surname Fonte Santa is a happy coincidence] and we will put together a publication with them. Two of these residencies will result in editions under the Moinho da Fonte Santa’s responsibility. Recently we had the guitar player Filipe Felizardo working on a sound and philosophical investigation, and recording his new album with the technical support of Cristiano Nunes. Next summer, the piano player Giovanni Di Domenico, who is a recurring visitor of this house, will come for a piano experience that probably will also result on a recording made here by our homemade recording structure, the “DoubleDog Music”, founded informally many years ago from an idea of the painter Biberstein, who was the great spiritual sponsor of the music that flowed, flows and will flow here at the Moinho da Fonte Santa. In which way is the selection process conducted? It’s a very simple process. People describe us what they intend to do, the time they want to stay and then we adjust everything with our schedule and the availability that people propose for their stay. We have a year and a few months of existence so, of course, the first projects were motivated by friendship connections, professional relationships with people that collaborate with us and that therefore we already knew. However, we started to receive proposals from new people including from other countries. But it is and it will always be a very informal process. What differentiates this artistic residency from other similar entities? Firstly, the legacy from which this residency was born, and the history that the house already had when it was the residence of the writer Ana Nobre de Gusmão and of the painter Michael Biberstein. The interaction in this house was already covered in a certain aura; this place was always seen as a magical experience of gatherings, creation, connected to music and to arts. 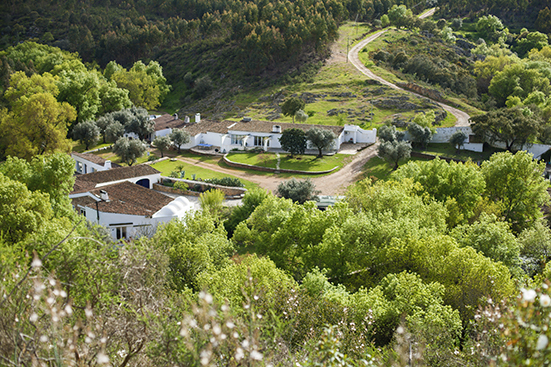 On the other side, the fact that is located in Alentejo in a natural setting very singular, very beautiful [it is a place by a bank] which is 10 km away of the closest village, makes it a very isolated place which encourages contemplation and retreat. Near the Moinho da Fonte Santa we also have access to archaeological interest points which are unique in the country: the Endovélico cult of pagan pre-roman traditions. All this area is covered in a certain “magnetism” or mysticism. What type of work has been developed at the Moinho da Fonte Santa? The visitors have been working on drawing, video, argument writing (we had a filmmaker duo, Jeremy Perrin and Hélène Robert, that were working on an argument for a movie that is already filming and also Ben Rivers and Gabriel Abrantes, which are also developing an argument for a short-film that was recorded last summer). We had a lot of musicians that came here to record and play together like for example, Noberto Lobo who played with a Canadian musician Eric Chenaux, because they were preparing two concerts in Portugal. There was a bit of everything. 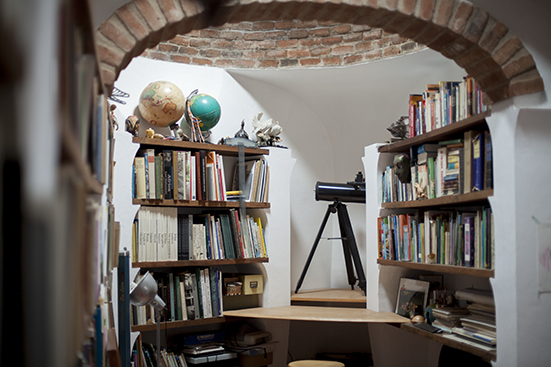 The publications “Circulo das Leitoras Peripatéticas” were mainly written here. Recently we had the Natxo Checa, director of ZDB working on the edition of his first short-film. Claudia Varejão was our first resident and worked on a new film that was displayed in Japan. Besides that she also helped us on the development of the website and on the photographic record of the Fonte Santa and surroundings. What kind of activities do you usually organize for the resident artists? We organize some sessions of outdoor cinema especially when we had the workshop with Claire de Santa Coloma in May 2014. That was a very intense week! But deep down the residency is destined to the development of the visitor’s work and not so much to public activities because the space is not really suitable for that. Those are very punctual situations. There are other activities/collaborations that jump off the spatial domain of the Moinho da Fonte Santa. The cinema festival “Porto/Post/Doc” last December in collaboration with the Moinho da Fonte Santa, created the award “Biberstein-Gusmão” that celebrates the dedication of these two artists to the art of cinema, awarding young filmmakers until 35 years old and consists on a residency for the preparation/development of cinematographic work. Due to an invitation made by the Berardo Museum, the Moinho da Fonte Satna recently displayed the Fernando Lopes movie that was filmed here in the Alandrioal in 2008, a documentary with Michael Biberstein called “O Meu Amigo Mike ao Trabalho”. The session had on the first half a video-concert of Garcia da Selva (Manuel Mesquita) which was a way for people to get to know out space and our activity at the Centro Cultural Transfronteiriço de Alandroal where, on the Festival Terras de Endovélico organizaed by the city hall of Alandroal, we were invited to organize a collective exhibition with works from some of our artists that where here throughout the year. What is necessary to become a resident? To elaborate a project, set the dates to develop it and attach some information about the purpose of the residency. It’s all about the duration of the residency, calendar and logistic compatibility of the project and also with the possibility of arranging a financial commitment, because, in the case of independent applicants, it is necessary that they are self-sustained, since the Moinho da Fonte Santa cannot provide the permanency, transportation, etc… The answer is always fast and the criteria are very wide. Above all, what matters to us is that people can take the best advantage of this place and that are able develop their work freely. More information about Moinho da Fonte Santa here.